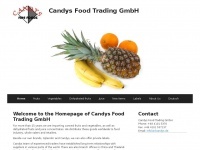 The web server used by Candys.biz is located in Germany and run by 1&1 Internet AG. The website Candys.biz has a own web server. The web server only runs this website. The websites of Candys.biz are served by a Apache server. The HTML pages were created with the latest standard HTML 5. Both the inclusion of the website in search engines and follwoing of its hyperlinks is explicitly allowed.